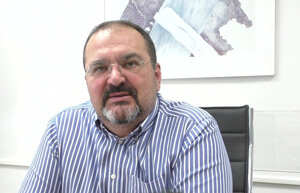 Stylianos Papathanassopoulos Professor of Media organization and policy at the Department of Communication and Media Studies - National and Kapodistrian University of Athens (UoA). He was the Head (2007-2011) of the Faculty, member of the Board of the Hellenic Audiovisual Institute (2006-20011) and is Visiting Professor at City University, London. Previously, he was Deputy Director (1996-2005) of the University Research Institute of Applied Communication (URIAC) and Deputy-Head of the Faculty of Communication and Media Studies (2003-2007). He has been Visiting Professor at the Technological University of Cyprus, and he has also taught at the University of Helsinki and the University of Sheffield. He is also a member of the Euromedia Research Group and was a member of the Network of European Political Communication Scholars (2008-2018) as well as he was a member of the research project "Changing Media-Changing Europe" funded by the European Science Foundation. He was a member of the Managing Committee of the COST Action "IS1308 -Populist Political Communication in Europe: Comprehending the Challenge of Mediated Political Populism for Democratic Politics" (2014-18). He is currently Director of the postgraduate program in Journalism and New Media as well as Director of the Laboratory of Journalism Studies both at the Department of Communication and Media Studies - National and Kapodistrian University of Athens. He is the Editor of the Greek communication journal "Zitimata Epikoinonias (Communication Issues)" and member of the editorial boards of the journals Global Media and Communication, European Journal of Communication, Digital Media & Policy, Social Media and Society, and Journalism Practice. In 2010, He formed SMG research group which aims to conduct research in the field of communication and media studies. The research group SMG provides design, implementation and analysis on current affairs, and ad hoc basis for specific surveys. It also aims to complement its research activity with publishing.